...and I'm going to make an assumption that there may be some interest in what's good and bad about it. I'm an avid reader, and I received a Kindle DX for Christmas last year - it's one of the greatest gadgets I own. It's fun to use, it's easy to get books, and the thing works perfectly fine as a Wi-Fi only device simply because of the sheer number of books you can load onto the thing. Beyond that, the OS is actually rather speedy. Some complaints of a sluggish OS has not been my personal experience - there is some slight drag from time to time, but nothing noteworthy enough to really care about. It looks cool, it plays cool. * The browser is solid: A lot of bytes have been spilled about Amazon's Silk browser. My benchmark was a) my Android phone and b) my desktop. I already knew this would be an improvement over my old netbook, so that wouldn't be fair. The result is that I'm happy. Pages load quickly and easily, no concerns. * Video playback is good: The resolution is fine - I tried Shutter Island, an episode of Star Trek: The Animated Series, and an episode of Lost that is typically in HD. The video quality was good in all areas. YouTube gets the job done as well. Also, trying Amazon's video service, the streaming quality of an episode of Arrested Development was high quality. I have FIOS in my home, so your mileage may vary, of course, but I have no complaints. * Reading books is crappy: When I think Kindle, I think books. Reading books on this thing is, quite simply, a miserable experience that I don't anticipate repeating in any way shape or form unless I absolutely have to. If you read on a Kindle, you have a certain idea of form, of positioning, of weight. This is a heavy block when it comes to reading, and I don't need to repeat the oft-stated point about backlit reading. * Hello, less than 8gb of usable space: I get it - the idea is that everything you need (music via Amazon's Cloud Player, streaming movies off of Amazon, etc) is in the cloud, so you don't need space. I don't see myself putting a ton of music or movies on this, but 8gb fills up very quickly. My phone has gigs of podcasts and Spotify music, and much of that is, supposedly, cloud-based, so I can see that being a minor issue. * Note to GMail users: A problem I ran into and inadvertently caused/fixed myself had to do with the two-step verification that I enabled (you do have two-step verification for your Google Account, right?). The native mail app requires one of those passwords, but doesn't prompt you for it. I spent a significant time on the phone with Kindle support, and no one at the support side knew to ask about that. So keep that in mind and be near a desktop computer when you're configuring your Fire if you have Gmail. And if you have Gmail and haven't enabled two-step verification, DO IT. Even with its problems, though, at the end of the day, I've come to really like the Fire. At $199, I'm not convinced you can do better for the value. With some good software updates, it might end up fixing some of those problems - the latest update rolled out Tuesday, for instance, tightened up some display issues and definitely improved the touchscreen accuracy, so Amazon is...kinda listening - and the thing's already been rooted if you're into that sort of thing. 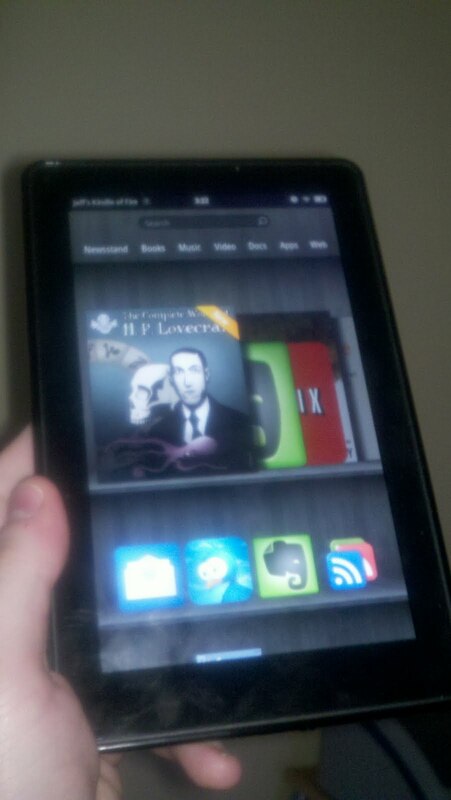 So I heart my Kindle Fire, and if you're going to have some Christmas money to burn, you might just heart it, too.